Not every remodel project we take on involves a full dumpster of old cabinets and drywall. Many of the kitchen transformations that happen week to week from our store involve just a few steps or stages and none of them include removing a wall of tearing out soffits. Not every project or budget allows for such an involved process. Truth be told, not every customer wants to go through the “full” remodel process. 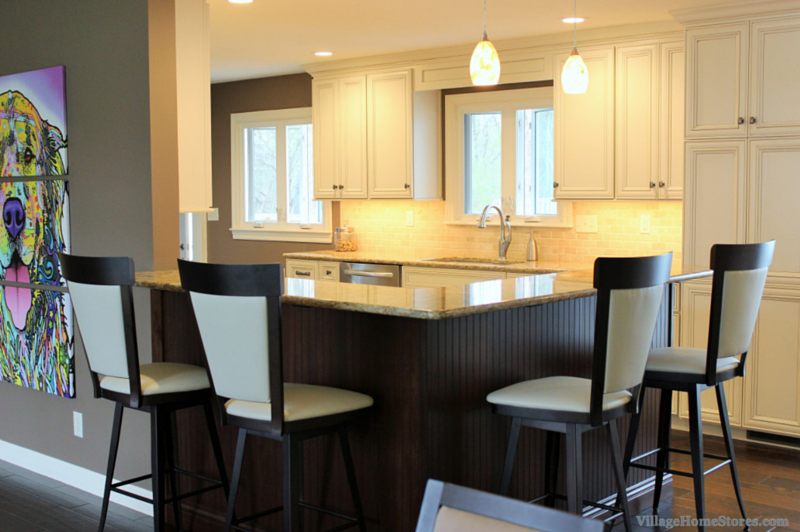 This remodeled kitchen in Moline is a perfect example. 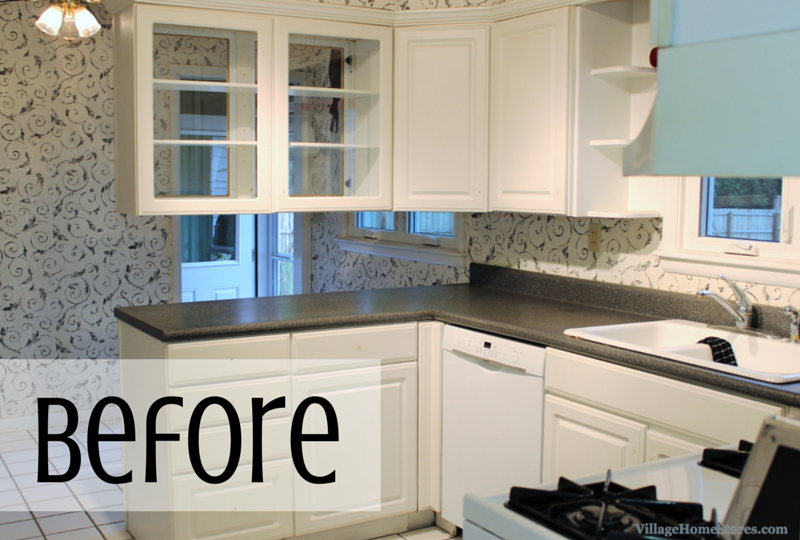 The layout of the existing kitchen worked well for this family but they were in need of an updated look without a huge mess. Many of our blog readers can relate to an existing Oak kitchen that just looks tired and ready for a change. Let us walk you through what we did to help this Moline couple get the finished look you see above. First a brand new kitchen island was installed from our Dura Supreme line. 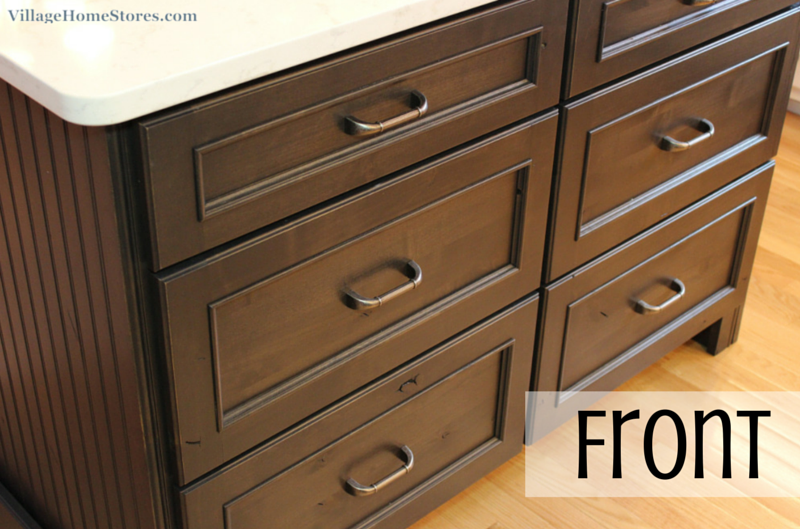 The cabinets are built from a Knotty Alder wood and finished in a “Peppercorn” stain. 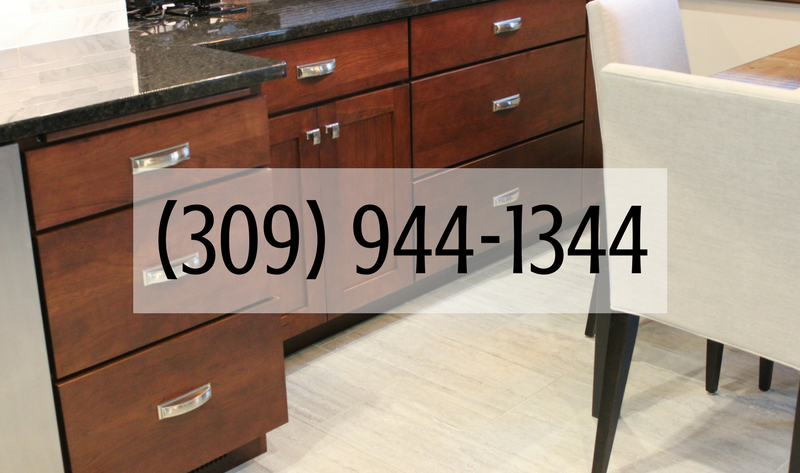 Many times customers shopping for an island think there are set standard sizes and styles of island cabinets. That is not the case. 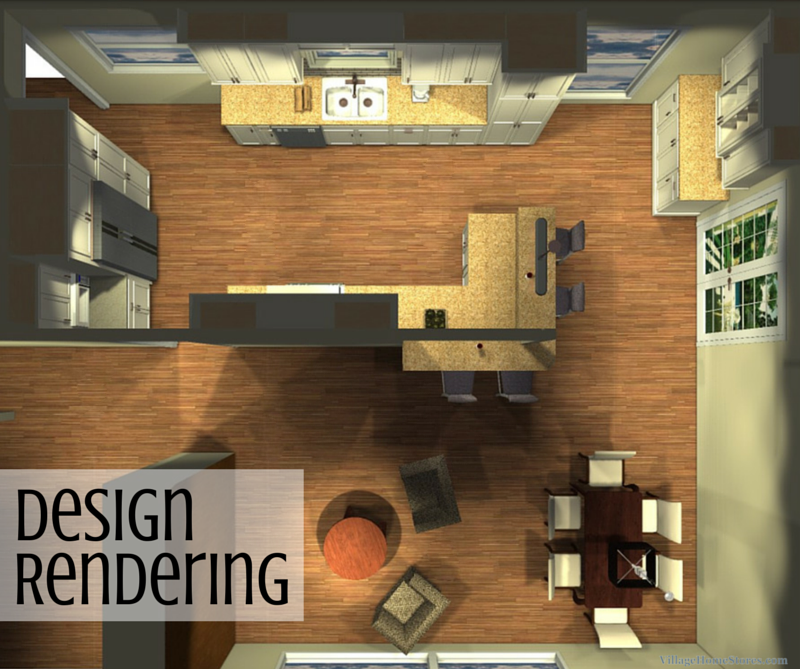 We can design a kitchen island to be perfect for your exact space and needs. 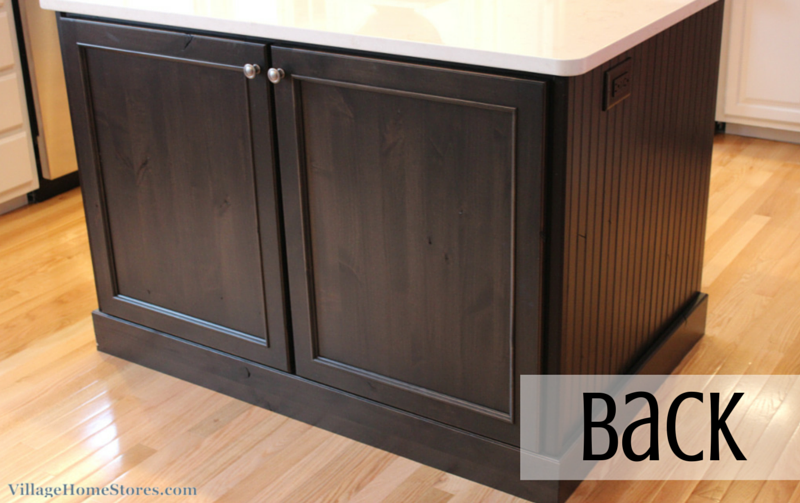 This island consists of just three base cabinets, paneling, and trim. 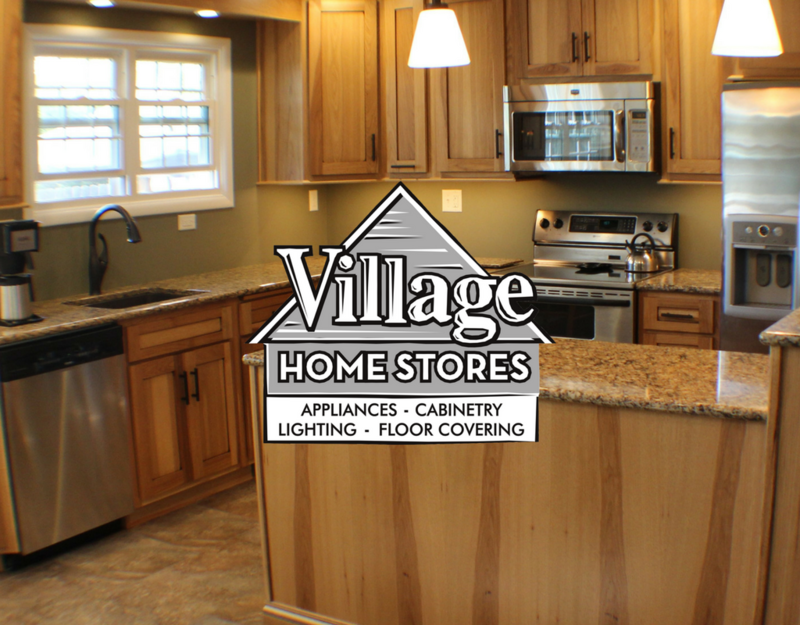 Your designer from Village Home Stores can help you decide what cabinets would be perfect for your island. In this case, two wide stacks of drawers on the interior were included for a lot of added storage. 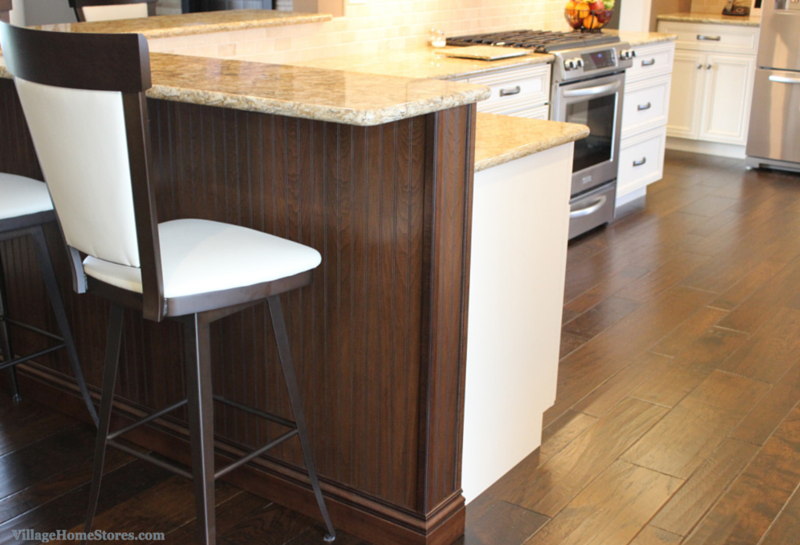 Outlets were also included on each end of the island to make prep and entertaining easier. 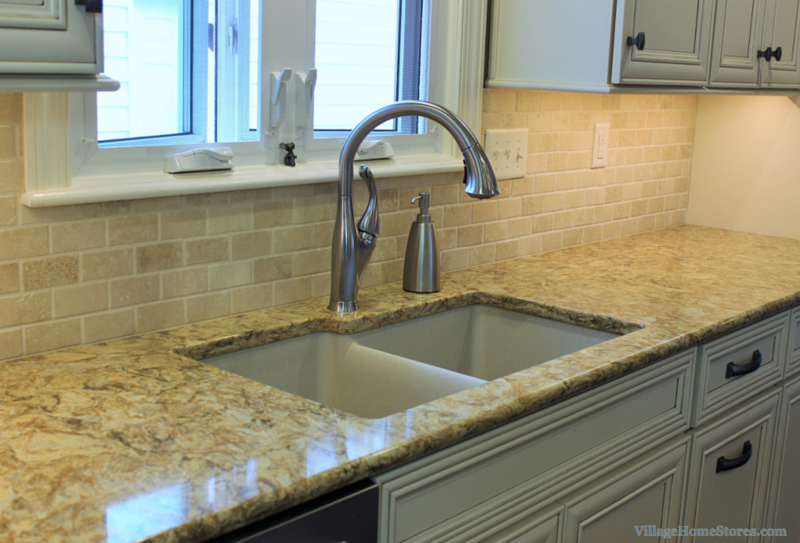 New countertops are the second element that went into this kitchen remodel. 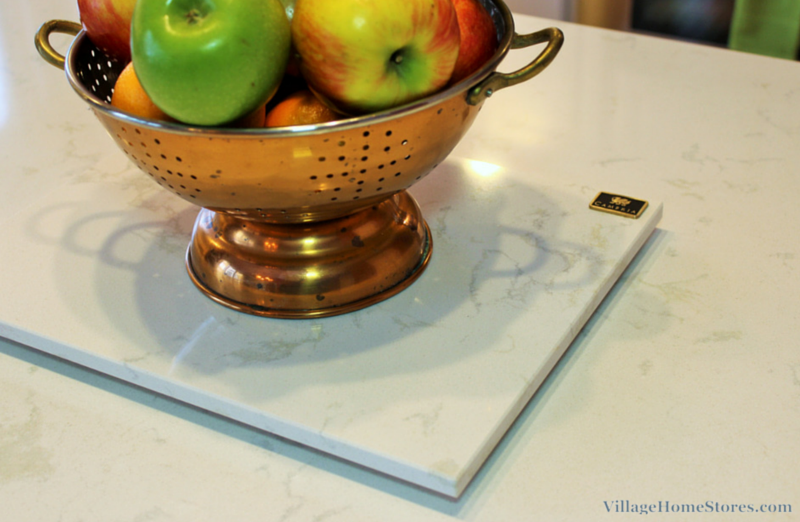 Cambria Quartz now covers the entire perimeter of the kitchen as well as the new island all in the “Torquay” design. A standard “Eased” edge profile was used. 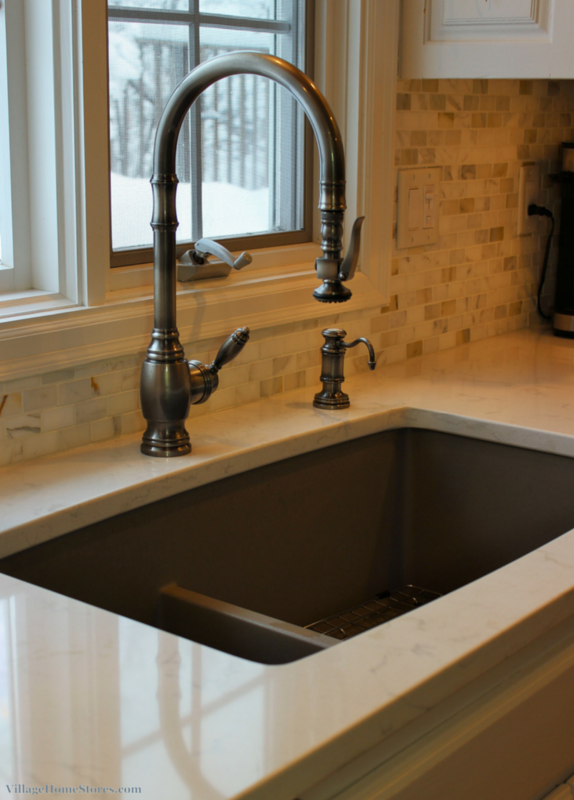 Anytime you are investing in replacement countertops it is an ideal time to replace your kitchen sink and faucet as well. How beautiful is this new sink? We have installed a number of this new finish of sink by Blanco called “Truffle”. The color is a perfect neutral taupe and pairs well with Stainless, Pewter, and Oil-Rubbed Bronze faucet finishes. The layout of this undermount sink is a 60/40 divided space. There is no Cambria backsplash installed so that the full 18″ from counter to cabinet can be filled with a beautiful new backsplash. 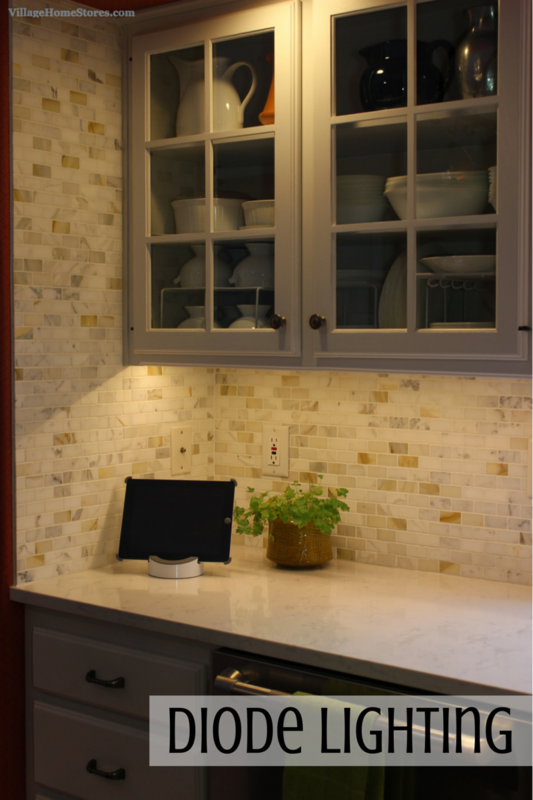 A warm and bright “Calacatta Gold” 1″ x 2″ backsplash tile surrounds the kitchen. and even extends up around the window trim and end wall. 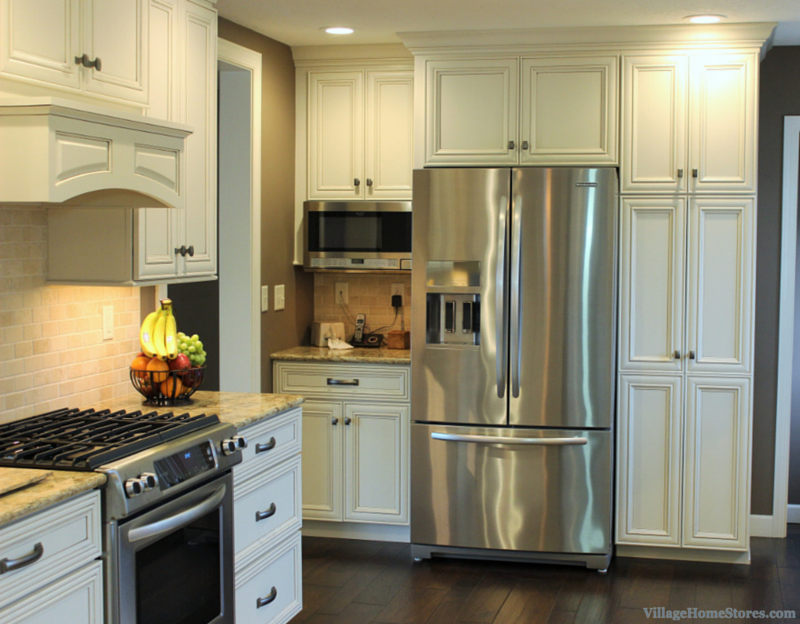 This remodeled Moline kitchen is another classic example of how our Diode under-cabinet lighting system can make a gigantic impact on your new space. These photographs were taken during the day but you can still see just how much of a showcase it puts the new backsplash on. 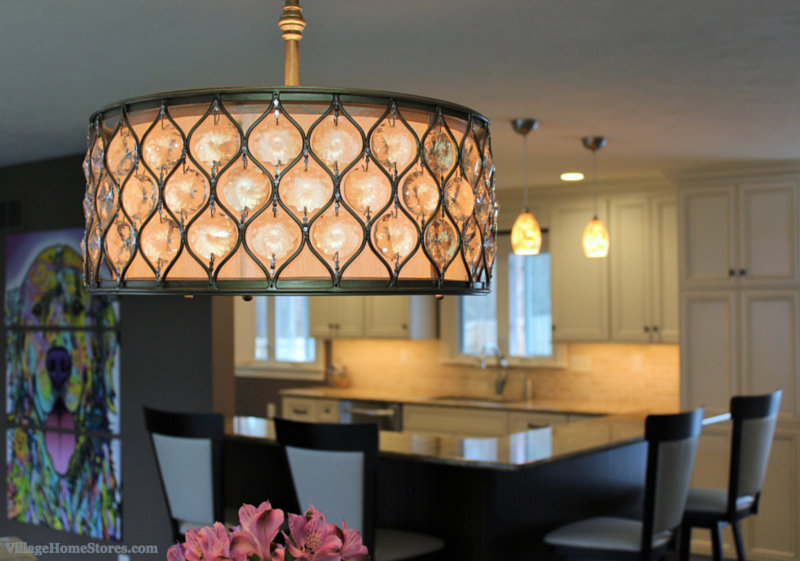 Just take a look at our last feature kitchen to see another example of this incredible lighting system. While this may look like a brand new kitchen the original Oak perimeter cabinetry was painted to give it a fresh new look. We also installed a brand new lazy susan in the existing corner cabinet of the kitchen. By painting the cabinets, replacing the counters, and installed a new island and backsplash this kitchen looks completely new! Does your dream kitchen seem like only a few steps away? You don’t have to take a sledgehammer to your space to end up with a beautiful new kitchen and this Moline home is the perfect example. 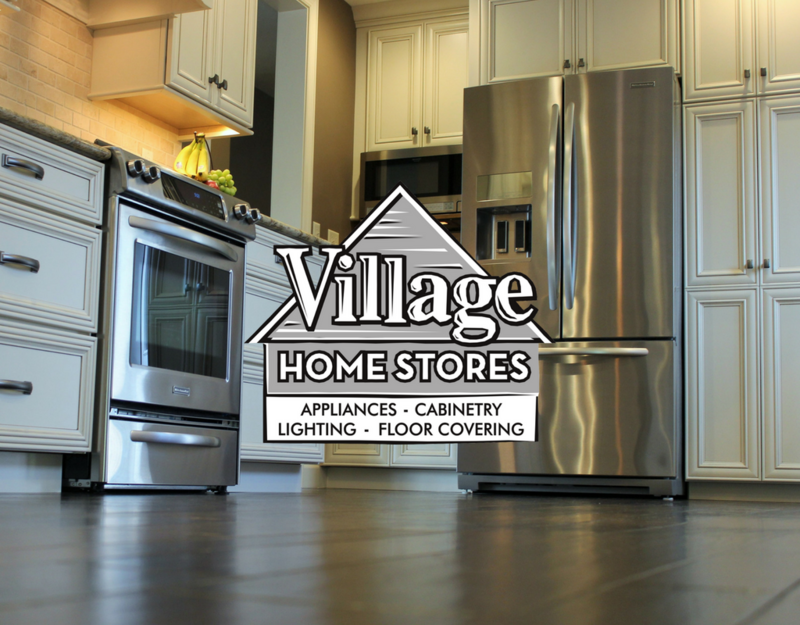 Call Village Home Stores today or email us here to set up an appointment to make your dream kitchen a reality. This week’s feature kitchen is a space that many of you may be able to relate to. The space within it is limited by doorways and openings. While we love showing you huge spacious new kitchens, the truth is most of the remodel projects we do are smaller spaces. 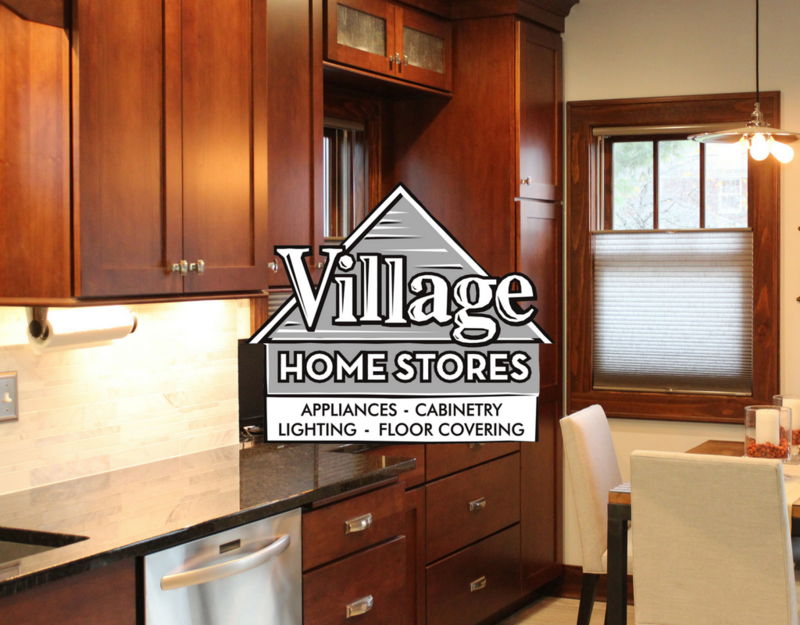 Designing and installing a new kitchen into an existing space that uses the cabinetry to it’s best capacity is what Village Home Stores is great at! This Davenport home is no exception. We borrowed space from a small eat-in nook and included that area into the new space that is Transitional in style and right at home in this historic neighborhood of great properties. You can see above the before, during and finished space. 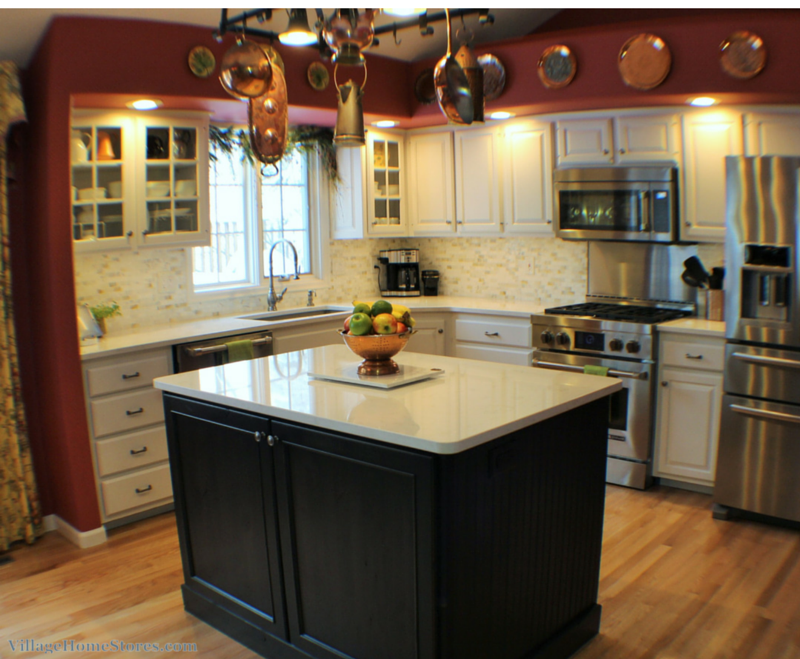 Cherry cabinets and neutral grays pair with rich granite tops to make a big impact and a smart use of the space. A flat-panel doorstyle can be so versatile when selecting materials. Koch Classic Cherry cabinetry in the “Savannah” style and “Brandy” finish compliment the woodwork and furniture in the home and the use of neutral grays keep the “Brandy” finish from seeming to red in color. “India Black Pearl” granite tops anchor the cabinets and keep you eye drawn to the contrast of the beautiful natural stone “Statuarito” backsplash from Jeffery Court. With natural stones come natural characteristics and irregularities. These should be expected when selecting tile made of true marble or granite. The flooring is a ceramic called “Grigio Al Contro” in an elongated rectangle shape. We thought sharing a birdseye view of the new design might help you get your bearings a bit more. You can see in the new design that the kitchen cabinetry now fills the entire sink wall and follows the return back into the old eat-in nook space. The new design still allows for a decent-sized table and chairs and room to navigate around it as well. The refrigerator you see in the bottom left is recessed into an area and out of the path into the kitchen. When facing the refrigerator, there is now an arched opening that accesses the stairwell just inside. 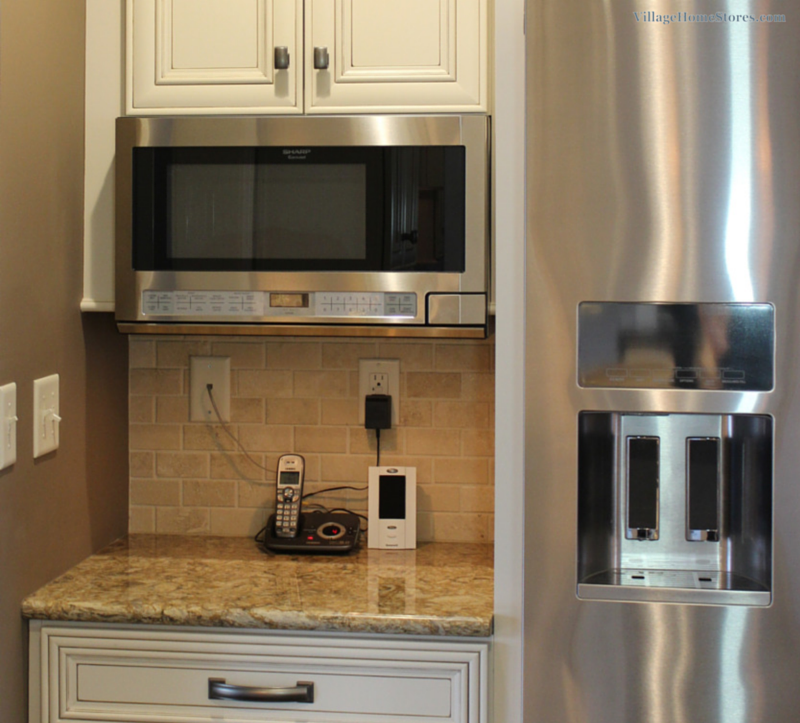 By keeping the refrigerator as a stand alone piece and recessing it into the wall, a full-depth model can be used. 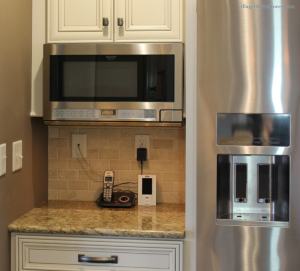 This KitchenAid french door unit is actually their largest capacity 36″ wide refrigerator available. Taking up the same width and height (72″) as many other models, it boasts a full 29 cu. ft. of storage inside! Making the most of the cabinet space in this kitchen design was key. A great specialty cabinet feature to show you is the pullout breadboard found right above the drawerstack to the right of the kitchen sink. See this pullout cutting board in action over on our YouTube channel here and see the full album of photos from this project over on our Houzz portfolio here. 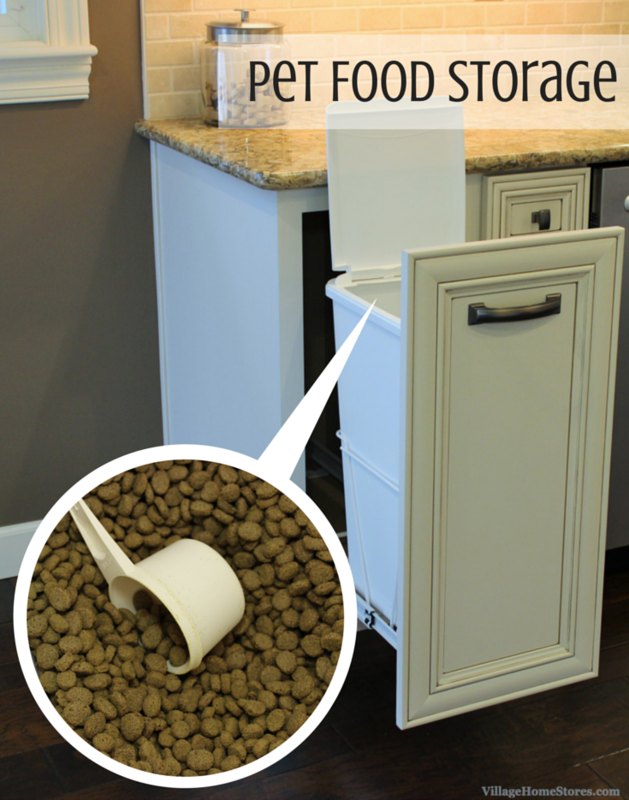 This can also be installed above a pullout trash cabinet to make it so easy to clean up as you prep a meal. In the corner of the new kitchen design sits an appliance garage. Small appliances can be pulled out to use and then hidden back inside out of sight when they are not being used. Appliance garages can be ordered with an “accordion” style door (shown), a door hinged right or left, or hardware that allows the door to pull forward and up. A corner of any kitchen can be designed a number of ways. Your Village designer helps pair the best design with your plans for using it. 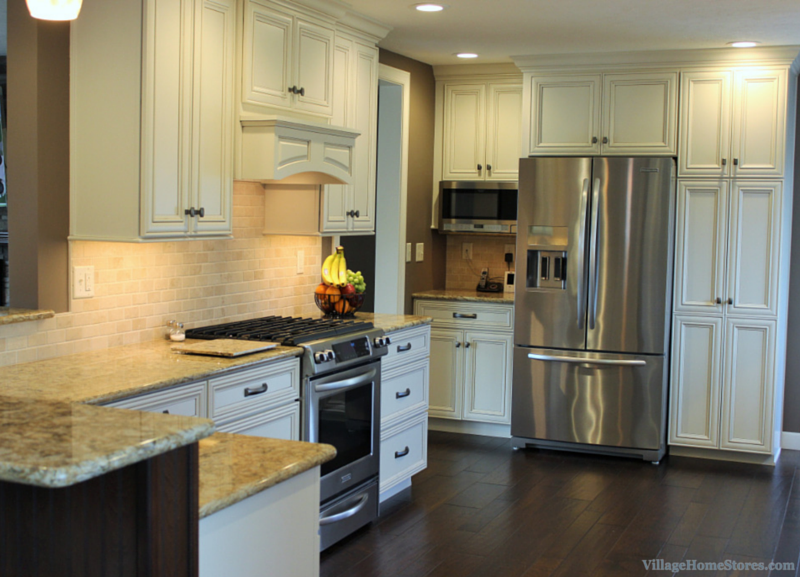 This Davenport kitchen remodeled by Village Home Stores included work by carpenters, electricians, stone masons, plumbers, painters, and tileworkers. All of these crews were scheduled and coordinated using our full Project Management program. We can manage your entire project from start to finish. This also includes helping your gather all of the estimates you need to get as accurate of an estimate possible for the entire project before a single cabinet is removed from your old space. 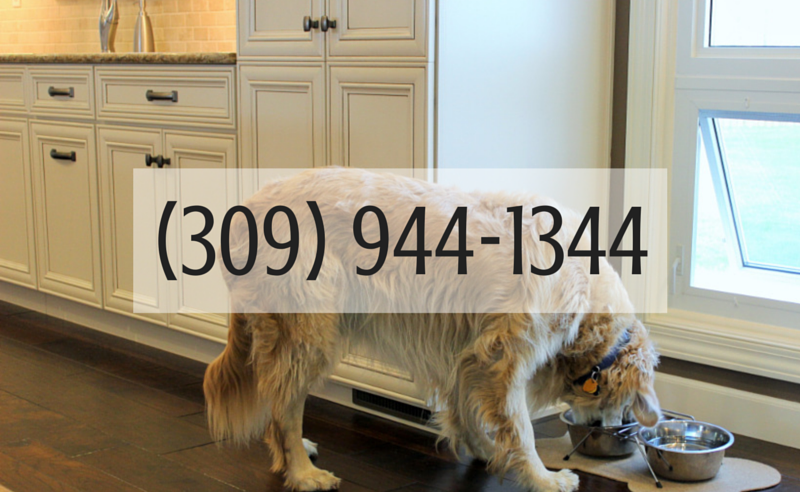 If you have any questions about this program or the remodel process please don’t hesitate to contact us or call us today. We service all of the extended Quad City area. I could not have picked a better time to stop by to take some final pictures of this kitchen in Rock Island, IL. It was the end of the day last Friday and the homeowners were hosting some friends for cocktail hour in their new space. Seeing customers enjoying the finished project and showing it off to friends is the absolute BEST compliment we could get. I felt like I was walking into a commercial for our Full Project Management service. The owners of this beautiful new kitchen were so enthusiastic to share how easy the estimate and execution of the project was from start to finish with their guests. While the shape and configuration of this island may appear strange at first glace, I got to see first hand how perfect it was. The raised bar-height top on the right end was the perfect place for guests to lean and set a drink and snack while the user is working in the kitchen. The location of this section of the island is actually where a wall was located previously. Here are some photos to get a better grasp of how we opened the space up. In the “Before” photo you see that a wall formed a narrow hallway behind the refrigerator and pantry. This wall was removed along with a beam that spanned the width of the old space. The temporary wall you see in the “During” photo was put in place until a new supporting header could be installed in the now wider kitchen. Now for the full tour of all of the great storage cabinets included in the new kitchen. A pull-out spice rack was installed adjacent to the range area for easy access to spices and cooking oils. While this cabinet happens to be a wall spice rack, base cabinet versions are available as well. 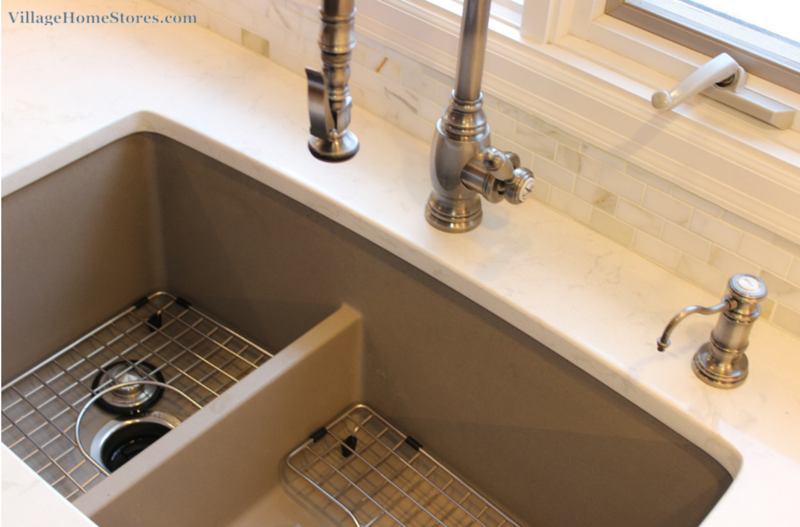 A great secondary use for a base pull-out rack is to hold cleaning products near a sinkbase. The new island also had great access to pots & pans storage in deep drawers immediately behind the range user. A pull-out cutting board located in the island is actually one of two installed in this kitchen. 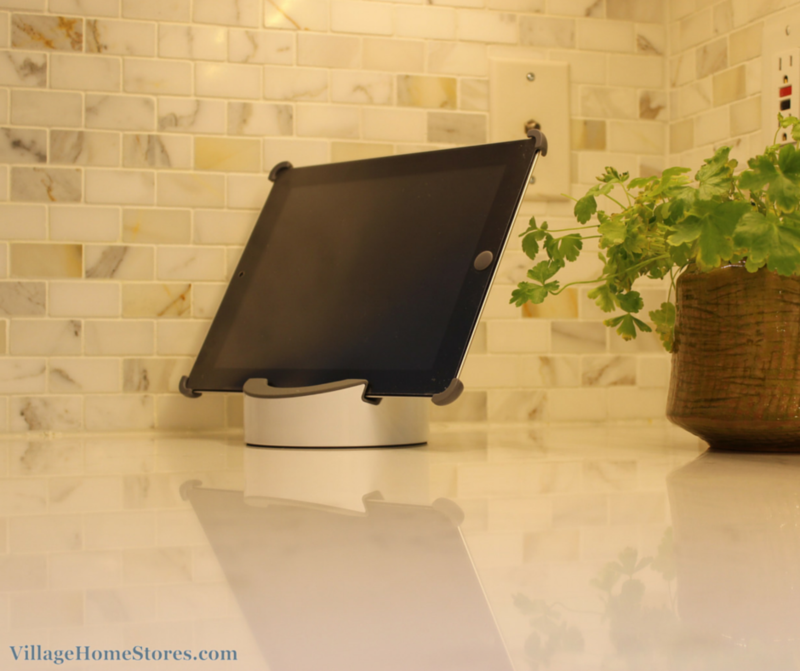 With two active users in the kitchen, there can now be many stations to prep and work in the space. My favorite storage solution in this new layout was hidden where you may least expect it. As I was taking photos of the island the customer exclaimed “Oh and you haven’t seen my favorite one!”. In the cabinet above the refrigerator were wood tray dividers and a wonderful deep space to store small (but tall) appliances. Now the reachable space in the base cabinets can house everyday items in place of these. An opening that once sat on the end of the old hallway area is now included in the new design. 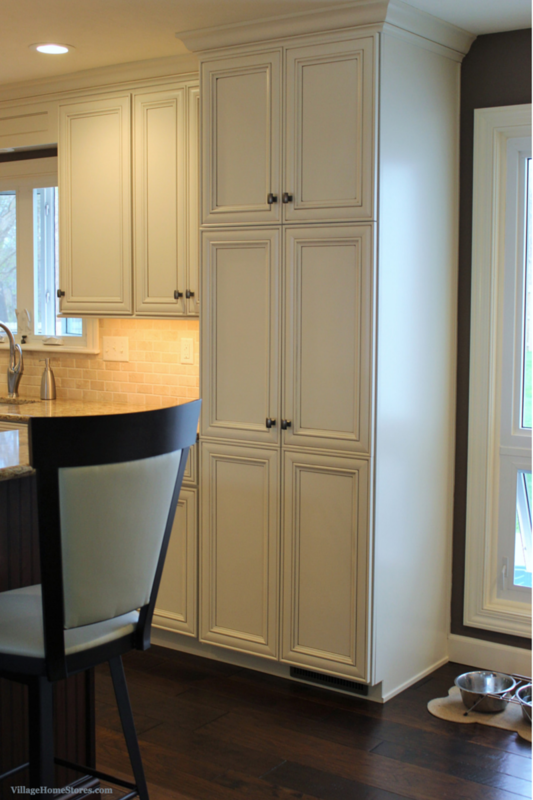 A face frame and door was ordered to match the new cabinets and create a custom look covering the cubby. Now access to this deep storage area looks like a well planned element of the new space. The customer plans on adding shelves to make for more pantry storage in the kitchen. 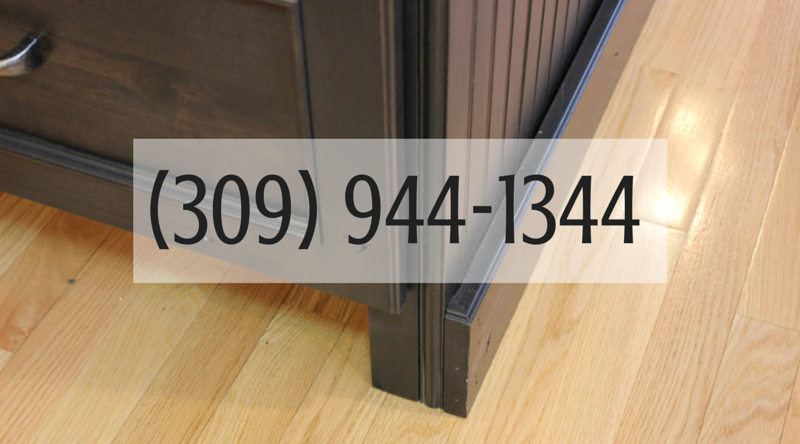 While face frames and doors make up a significant part of the cost of a cabinet, sometimes the purchase of one and some added trim can make a great custom impact. Cookbook storage and an angled base cabinet were two other areas worth noting in the new kitchen design. 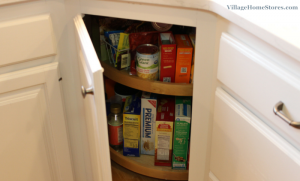 Angled end cabinets can be a great way to add storage an not intrude on traffic paths in a space. You are able to extend the counter and storage an they make a great cap for row of cabinets in place of an abrupt square stop. In this case a table was just beyond the end of this counter and now a seated guest will not feel crowded. 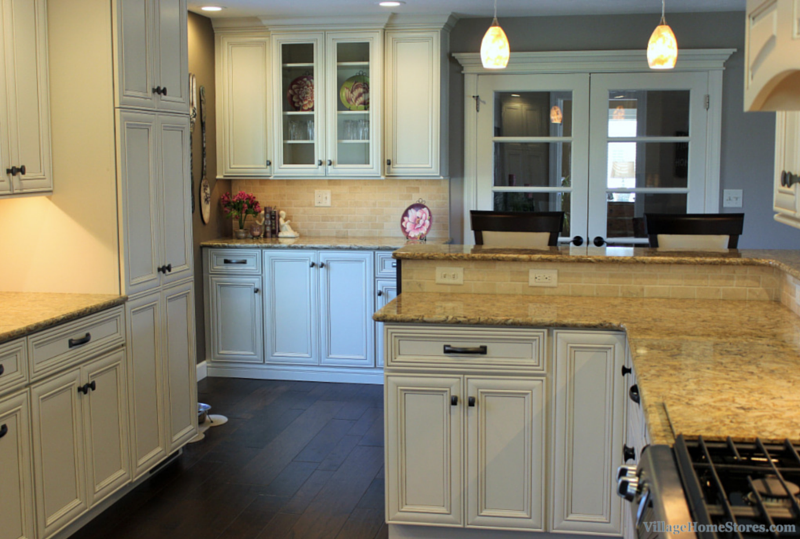 Do you have a kitchen that may be able to be widened or reworked for a better solution? Just having a hard time figuring out how it will work best? We would love to talk to you about it. 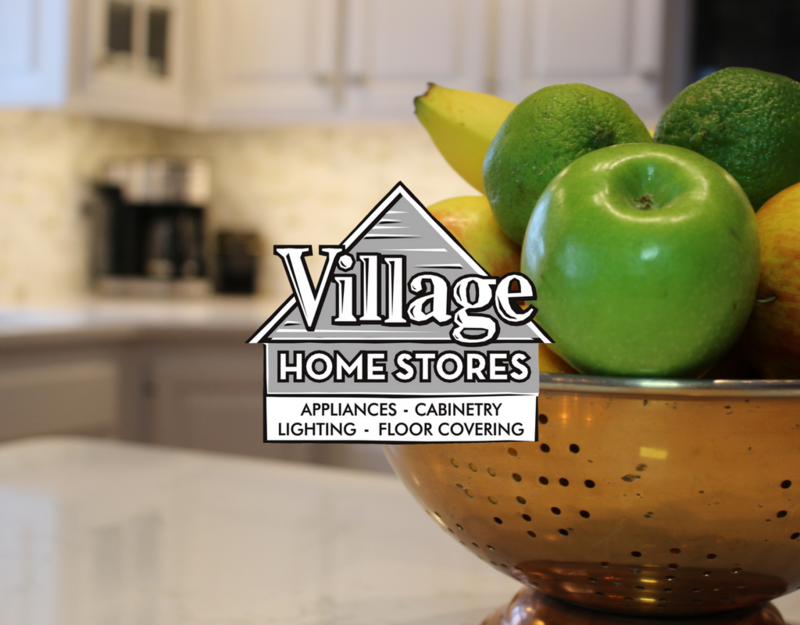 Our team at Village Homes Stores can show you full-colored rendered images of your new space before any walls or soffits get torn down. This way you can visualize your new space before any mess is made. Contact us today for an appointment so we can begin the discussion with you. We would love for you to be our next “Before & After” story!